So, Arko. 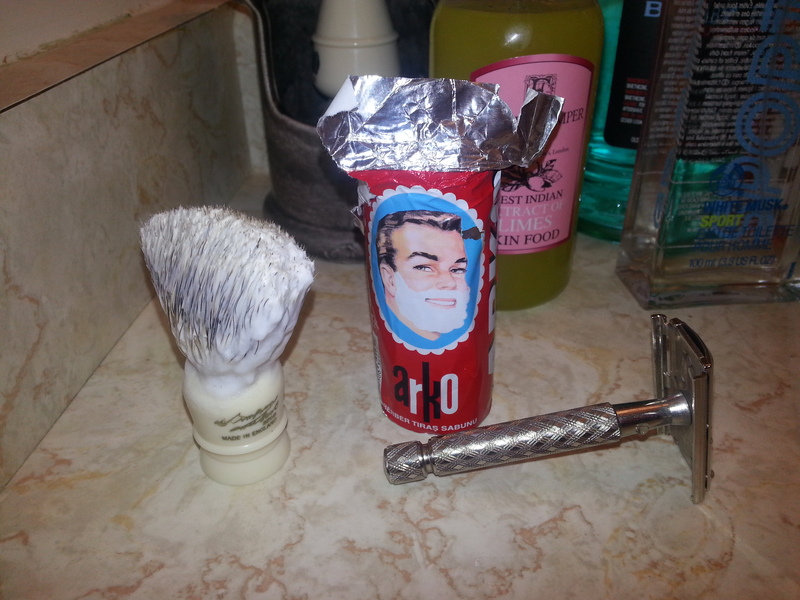 I’ve heard a lot about Arko’s shaving stick, before I gave it a shot. It seems to be a “love it or leave it” proposition. Most of what I heard about it lead me to believe that I wouldn’t like it. I was right. The smell. It’s chemically, like a cross between medicine and cleaning product. I’ve heard comparisons to Borax tossed around, as well as urinal cakes, and “Ivory soap on steriods”. A bit more kind of a comparison was probably to lemon pledge. Actually, yeah, I think the urinal cake comparison is probably the most apt (unused at least!). Strength-wise, it was definitely noticeable and never really faded all that much. Naturally, what might be a good thing for a soap that smells nice is a bad thing for a soap that doesn’t. But, anyways, Arko is mostly a popular soap mostly despite its scent, , not because of it, although there are indeed some people who like it. It performs well, and is insanely cheap to boot. It lathers up quite easily (I should note that it’s supposed to be particularly good for folks with hard water), nice and thick, good glide. Takes about what I’d say is a medium amount of water, and has a decently large “sweet spot”. I can’t say I noticed much in the way of moisturization after the fact. But still, a good shave and cheap. not, IMHO, good enough to rescue the stench.. Cost: I got the stick shown off of someone over on the shave bazaar, but as mentioned they can be found elsewhere quite cheap, such as this offering for $18 per dozen 75 g sticks, or $2.39 for a single off the same site. Ingredients: Potassium Tallowate, Stearic Acid, Potassium Cocoate, Aqua, Sodium Palm Kernelate, Glycerin, Parfum, Paraffinum Liquidium, Cl 77891, Tetrasodium EDTA, Etidronic Acid, Disodium Distrylbiphenyl Disulfonate, Amyl Cinnamal, Citronellol, Geraniol, Hexyl Cinnamal, Linalool. The smell changes and lessens after airing out for a bit. I mashed mine into a bowl, and then a week later or so, the smell had shifted to a lemony kind of scent. I didn’t mind the smell initially though. It smells like a cheap detergent may but performs well. Thick and good lather. I’m only complaining to dry my skin quite. If you have a dry skin, you should need balm or sooting products. Ivory Soap was the first smell I picked up. But I do like the way it lathers up. I like using it when I have at least a day and half of stubble; the heavier stubble really picks up the soap as you glide the stick across your face. This soap gives me a better shave than any “luxury” shave cream or soap, and I’ve tried a lot of them. It smells like ivory soap to me. Sup man. I enjoy your reviews, but I find your descriptions of aromas lacking. Granted, shaving soap aroma is basically the biggest reason why I like wet shaving, so perhaps I pay too much attention to it. For me, Arko definitely has a base that is soap-like and fresh, but it’s a smell that goes away quickly (no “aftersmell”). There’s definitely lemon in there, as you say, which might contribute to that “fresh” note. I then get vegetal tones, not unlike parsley, but much more like celery. Finally, I get a vegetal pungence that reminds me of corn masa (like tamales, if you’ve ever had them). Despite our misaligned priorities, keep up the good work! I’m /u/djhs. I think maybe you’ve just got a more accurate nose than me! Glad to be of some service.